This is not my best work, but here it is anyway. 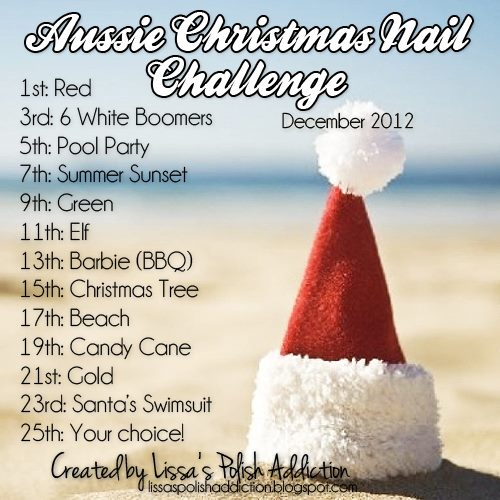 I seriously don't know what Elissa what thinking when she decided to add Six White Boomers to the Aussie Christmas challenge. Hopefully the other themes will be a little easier. Unlike a few of the other girls posting who didn't actually know what this was about I knew exactly what Six White Boomers was. 'Six White Boomers' an Australian Christmas carol by Rolf Harris that is about how Santa returns on Christmas Day to help a little joey find his mummy. The song tells the story of how Santa unharnesses the reindeer's when he arrives in Australia (cause it's just too hot for them) and instead he straps on six white boomers. Boomers are large kangaroos, which get the name boomers from the noise they make when the bounce along. So here are my 'white' boomers, which are silhouetted against the sky, flying in front of the blazing sun! The gradient was created using Ulta3 Lily White, Picture Polish Sky and Ulta3 Blue Heaven. Sun with Ulta3 Honolulu. Sleigh and kangaroos made with water decals. Aussie girls, do you remember this song? Thank you. Not quite 20 years for me, but I didn't realize the song was that old. Happy Birthday! 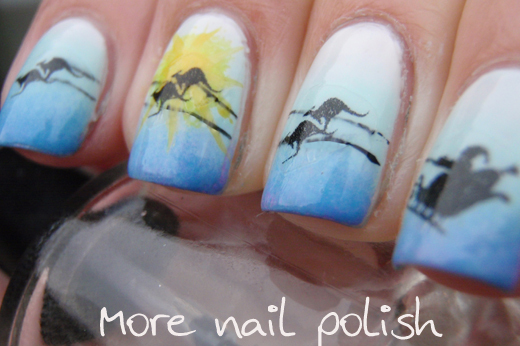 Great job, I love those roos silhouetted against the sun! They look great :) I'll admit I don't really know the song, but I did guess it was by Rolf Harris! And I have no idea where he'd think Santa would find 6 white kangaroos!! I know, I don't think I've ever seen a white roo. Awesome!!! You did an awesome job :) Haha I'm sorry it was so difficult! The rest should be much easier! Absolutely loved this one!!! Loved reminiscing over the video clip too! Great mani - loads of fun and HAPPY BIRTHDAY too!!! I'm really impressed by this mani! Also I'm Canadian, but I actually sang this song in my elementary school choir, haha so it was fun to be reminded of it today! 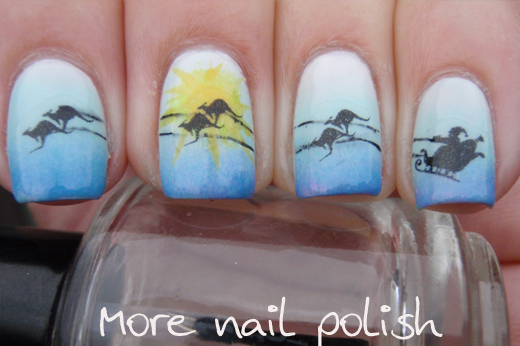 Awesome mani! You're the true master of water decals ;) Hope you are spoilt rotten on your special day. wow!!! 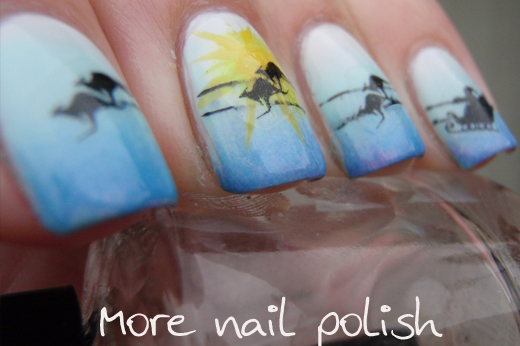 that's great nail art! Oh, I absolutely love this, so cute! This is too cute! Being from the U.S., I had no clue what six white boomers were, LOL.